Tomorrow the Goverment will force indigenous peoples off treaty lands. Tonight the thunder beings are here with us. The Thunder Beings are a race of powerful storm spirits from Algonquian mythology that live in the sky and cause thunder and lightning. They are strongly associated with birds, but may appear in legends as powerful sky-beings, giant eagles, or an intermediate form between the two, such as a bird with a human head. Thunder Beings are dangerous spirits who sometimes kill people with their powers, but they are also sworn enemies of the horned serpents and sometimes rescue people from those monsters. The deadline for the evacuation of the Dakota Access Pipeline protest camp arrives Wednesday, but several demonstrators have declared they will not leave and are bracing for a stand-off with law enforcement. Leaders have said that approximately 300 people remain at the camp. "A lot of them are going to stay and they're not going to give up, no matter what army they bring in to make people back off," one of the camp’s leaders Lewis Grassrope told Newsweek. The Corps has told those who remain in the Oceti Sakowin camp that they needed to leave by 2 p.m. Wednesday. Gov. Doug Burgum listed the same time and date in an emergency evacuation order last week. Some protectors plan to move, but some in the camp are ready to go to jail and "will engage in peaceful, civil resistance ... holding hands, standing in prayer," said American Indian activist Chase Iron Eyes. Morton County sheriff's deputies can arrest people who won't leave. Army Corps rangers who are in the area can't make arrests, but they can write citations for various offenses including trespassing that carry a maximum punishment of a $5,000 fine or six months in jail, Corps Capt. Ryan Hignight said. While some in camp feel "under threat" by Wednesday's deadline, most are focusing on moving off federal land and away from the flood plain, said Phyllis Young, one of the camp leaders. "The camps will continue," she said. "Freedom is in our DNA, and we have no choice but to continue the struggle." Other camps are popping up on private land in the area, including one the Cheyenne River Sioux has set up about a mile from the Oceti Sakowin camp. "A lot of our people want to be here and pray for our future," tribal Chairman Harold Frazier said. 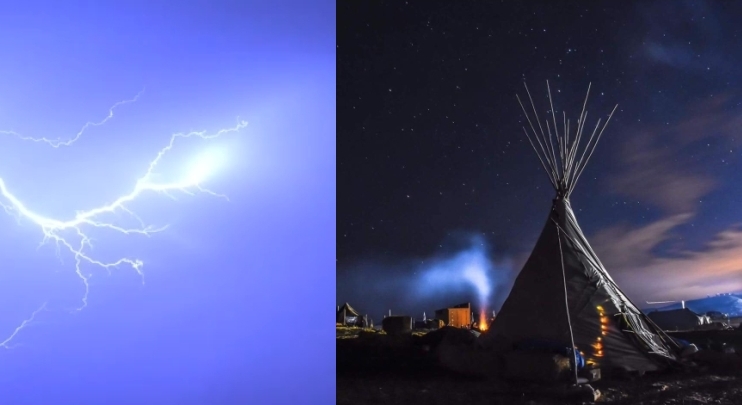 Responses to "Spirit of the Ancestors: Thunder and Lightning lights up Standing Rock sky before forced evacuation"